These Frenchies are so cute. First of all, I love European design. Especially children's things. While I know we make tons of wonderful, fun & beautiful things for children right here, believe me I know, there is just something different about imports from Europe - whimsical, bold designs that I just love - special. 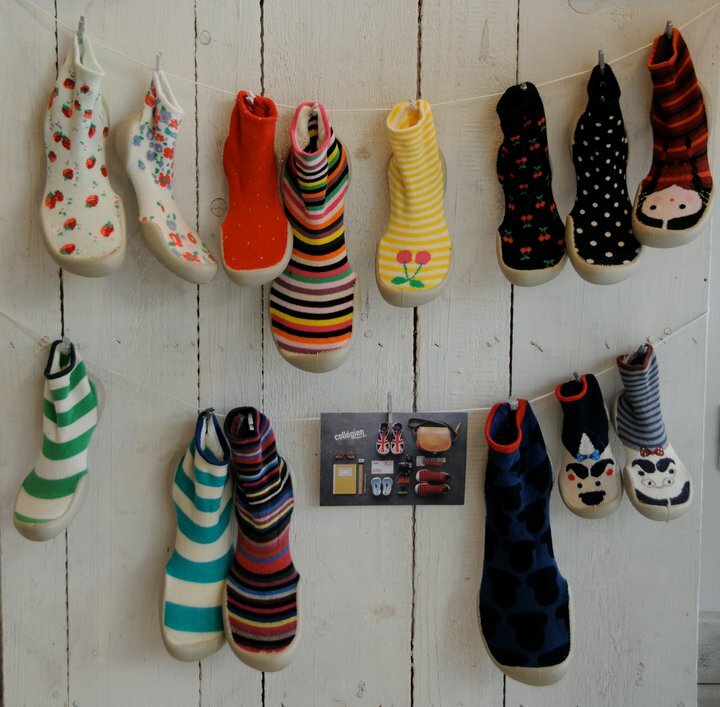 These slipper socks from France and they are so much fun! Just look at the designs! Can you argue? Now that I've gone on and on about just how cute they are, let me tell you about their function. 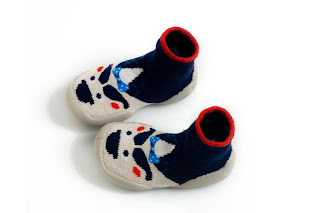 These are comfy, flexible, non-skid, super cute, & washable! Juju always has slippers, but these are his new must haves. One day he couldn't find them before coming down stairs one morning nearly panicked - I assured him they were just in the wash.
What I love about their function, is that ju can do his outside chores in them. He takes out recycle to the bin & grabs the mail. I wouldn't recommend them for outside wear, but they are perfect for stepping outside - even on rainy days. This is the design Juju chose. Aren't they perfect??? I'm going to have to order a pair for these little Capri feet once she's walking! 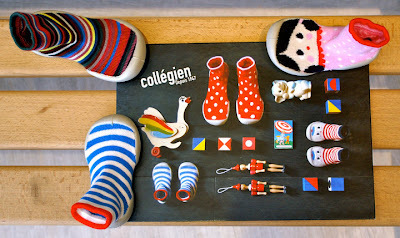 Visit Collegien and tell me which colorway you like best & become a friend @ Wishing Penny via Google Friend Connect. Both parts mandatory to win - thanks. *Follow me @jamaise at Twitter & Tweet this : RT @jamaise #GIVEAWAY #WIN -Collegien ~Slipper Socks ~ Straight from France! http://bit.ly/fpDR2L Ends 3/15 tweet each day for one entry each ! Disclaimer: Collegien provided me with all information and product to review. I was under no obligation to review it if I so chose. Nor was I under any obligation to write a positive review or sponsor a product giveaway in return for the free product. I follow via GFC and I like the Fauvette 5670 031. I love the flowers on the Farwest 5675 015. I a follower via GFC and I would get Farwest 5675 439 or my daughter! my daughter would love the farwest doll ones! not sure on French sizing, she needs equivalent to 10 toddler! LOVE Great 1176C - the Union Jack! I like the Damier 9971 115. I follow via GFC and I like their Favoris slipper socks. I entered your Hand Sanitizer giveaway. GFC follower and my favorite is the Festin 5677 510! I like the Grappe 1174 E.
Following you on Twitter (amt946) and tweeted. I like the Damier 9971 400. I follow through Google Friend Connect. I entered the Angelina Ballerina DVD giveaway. I like the Estaminet 5175 050. I follow via GFC as nightowl. #1 I (just friend requested) Like/Fan Collegien @ Facebook. #2 I (just friend requested) Like/Fan Collegien @ Facebook. #3 I (just friend requested) Like/Fan Collegien @ Facebook. #1 I follow you via GFC as nightowl. #2 I follow you via GFC as nightowl. #3 I follow you via GFC as nightowl.